Three actors, three ages, one soul: Barry Jenkins’ beautiful, sensitive Moonlight (Grade: A) tells a coming-of-age story in passages, each possessed of enough standalone power to operate as a wonderful short film, even as the whole proves much greater than the sum of the parts. It’s only Jenkins’ second feature, after the walk-and-talk romance Medicine For Melancholy, which he made seven long years ago. 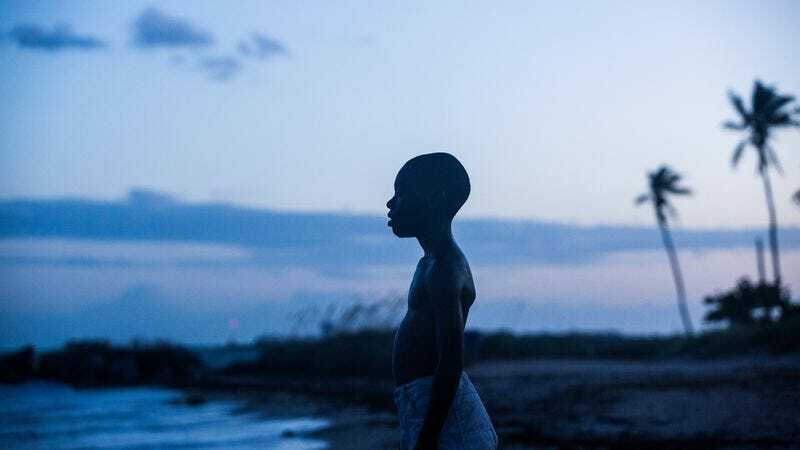 But the time away seems to have done him good: Moonlight builds on the filmmaker’s gifts—for eliciting naturalistic performances, for capturing nuances of body language—while also exhibiting a clear leap forward in visual storytelling. I was gripped from the opening shot, in which the camera pivots around a parked car in an impoverished Miami neighborhood, surveying the film’s primary setting, as the Boris Gardiner song sampled on the opening track of Kendrick Lamar’s To Pimp A Butterfly plays softly in the background. We follow shy, taciturn Chiron through three stages of his young life, watching him change from a 9-year-old boy (Alex R. Hibbert) to a gawky teenager (Ashton Sanders) to a quiet, muscular man (Trevante Rhodes). Chiron is black and gay (though the latter isn’t something he seems capable of saying aloud), and one could mount a case for Moonlight on grounds of representation alone: Rarely does American cinema even address this kind of character, let alone with such poetic grace, and Jenkins casually shatters stereotypes, as when he subverts the expectations we might have of Chiron’s drug-dealer surrogate father (Mahershala Ali). Likewise, the filmmaker has already been earning praise, here in Toronto and from Telluride, for his thematic ambition; this is a very smart movie about masculinity—the expectations put on boys to act, talk, and feel a certain way, to always fight and to never cry. But like most great movies, Moonlight rewards on multiple levels: as an immersion in a particular environment, as a gorgeous mood piece, as a romance unfolding with sweet, almost painful hesitancy. The three actors playing Chiron create continuity of performance, so it really does feel like we’re seeing the same person in each segment, older but with an unchanged heart. (All of the acting is pretty phenomenal, actually; Naomie Harris, who plays Chiron’s addict mother, creates her own devastating arc across this symphony.) And while Jenkins has cited Hou Hsiao-hsien (specifically his era-jumping triptych Three Times) as an influence, I saw plenty of another master Asian filmmaker, Wong Kar-wai—especially during a languid late stretch in a diner bathed in warm light and flooded with jukebox sentiment. This is a major film in a minor key. It opens next month. Mark your calendars. Almost every critic I’ve run into in Toronto has raved about Moonlight. But where’s the fun in consensus? A much more divisive film about America, The Bad Batch (Grade: C) bored me to tears, even if I could see why another critic might call it, say, their favorite American movie of the year. The second feature by Ana Lily Amirpour, who made the hyper-stylized vampire flick A Girl Walks Home Alone At Night, the film is set in a scrapyard dystopian future where the Texas desert has become an exile zone for undesirables. Deposited here in the opening scene, a barcode seared behind her ear, Samantha (Suki Waterhouse) quickly falls into the clutches of cannibalistic bodybuilders—and as they saw off two of her limbs, you begin to wonder how HAM this thing is going to go. Not very, it turns out: As in Girl, Amirpour betrays a chiefly cosmetic interest in genre, epitomized by the scene of Waterhouse standing before a mirror, a cut-out magazine scrap creating the illusion of two arms. The Tarantino influence is even more pronounced this time, evident in a track list of ironic pop selections (Ace Of Base accompanies the dismembering), throwback widescreen vistas, and the cameo appearances of major stars (including Jim Carrey, nearly unrecognizable in his one scene). QT, of course, usually delivers a few thrills to go with his relentless homaging, while nothing much disrupts the chic narcotism of Amirpour’s gaze. Shots of an uncompleted American-flag puzzle and some grizzled survivor done up like the Statue Of Liberty hammer home the film’s “subtext.” There are no stakes, but there are a couple of good jokes, like suggesting that roughing it with a flesh-eating Texas viking (Jason Momoa, kind of endearing as the strong, silent type) may be more fulfilling than sleeping with a gasbag one-percenter (Keanu Reeves, delivering the requisite Kill Bill monologue). Films angling hard for an instant cult following are a major pet peeve of mine, so [standard mileage-may-vary disclaimer]. Just don’t expect much of anything to actually happen in this movie. Given its grab-bag approach of pulling selections from other festivals, it’s not uncommon for Toronto to double-book its auteurs. Still, Chilean director Pablo Larrain should be proud to have two unconventional biopics about overexposed public figures playing at the festival—even if one is significantly better than the other. Neruda (Grade: C+) chronicles the 1948 manhunt for Chile’s multi-hyphenate poet superstar Pablo Neruda, who went into hiding when the government impeached him and made communism illegal. Rather than stick strictly to the facts ma’am, Larrain invents a detective (Gael García Bernal, who starred in the director’s previous No) assigned to the case. Bernal is a deadpan gas in the role, and the scenes of him narrating his way across a brightly stylized vision of 1940s Chile pop with noir flavor. But they also underline how tediously uneventful the Neruda passages are, in part because the version of him Luis Gnecco has conceived is no deeper than gossip made flesh. Larrain is clearly using one fictional construct (the hard-nosed gumshoe) to underline the fabricated nature of another (the “real” Neruda), but the juxtaposition does no favors to the expository portions of the movie. Jackie (Grade: B+) is much better and bolder. Natalie Portman plays former First Lady Jacqueline Kennedy just hours and days after her husband was assassinated in the seat next to her. For the most part, Larrain takes Jackie’s subjective vantage on events, and for a while, the film exists in a bubble of exhilarating disorientation, laying out the bizarre, harrowing aftermath of the shooting in elliptical vignette: Jackie wiping blood from her face in preparation to greet the nation; Jackie, still plainly in shock, making tough decisions about the funeral and breaking the news to her children; Jackie cradling JFK’s hemorrhaging head, trying to keep it intact, as the motorcade races down the highway to safety. It’s a portrait of a famous dreamlife curdling into a public nightmare, shot in queasy close-up and propelled by the sinister strings of a new score by Under The Skin composer Mica Levi. At first, Portman seems distracting in the role, the accent catching in her throat, her every line and mannerism coming across as studied. But that affected quality is all part of the strategy of Jackie, which establishes its interest in performance—in the idea, similar to Neruda’s, that we could never see the “real” person behind the iconic persona—through cutaways to a recreated, all-smiles tour of the White House. Even the familiar framing device, in which Billy Crudup plays a journalist interviewing Jackie, plays into the idea of an identity being shaped through omission. (“I don’t smoke,” she tells the reporter, between drags on her cigarette.) Jackie gets a little too on-the-nose in spots, and the later scenes, in which she agonizes about having a processional for the funeral, devolve into one too many speeches about legacy. But the film is so arrestingly off-kilter that it puts most of its biopic brethern to shame. Like Larrain, Werner Herzog has two films playing here at TIFF this year. Because I heard almost nothing but bad things about his fiction feature Salt And Fire, starring Bernal and Michael Shannon and the German director himself, I skipped it to write instead. But I did make time for its documentary counterpart Into The Inferno (Grade: B), in which Herzog embarks on a global tour of various active volcanos with one of the subjects of his earlier Encounters At The End Of The World. Herzog’s best docs tend to be his more focused studies of one person or place, rather than the kind of scattered survey he’s conducting here. Still, the individual parts are often quite entertaining, from the time spent with a wildly gesticulating researcher to a segment on North Korea that says as much about the country’s facades as the entirety of Under The Sun. Also, volcanos are just really cool. My complaint about Herzog’s last doc, Lo And Behold, Reveries Of The Connected World, was that it didn’t provide much opportunity for cinematic imagery. That’s certainly not the case here; shots of molten lava erupting from the rock are never less than mesmerizing. Plus: Speaking of quality biopics, Terence Davies’ A Quiet Passion (Grade: B+), about the life and career of Emily Dickinson, is often witty as hell—at least when characters aren’t keeling over dead. (It helps that Cynthia Nixon plays the lead, in a lively, passionate performance that makes me wish she had a better career.) And then there’s Damien Chazelle’s La La Land (Grade: A-), which is the exact kind of pop confection that I love: one that laces its exuberance with melancholy. Yes, the film is very self-conscious about its place in the history of musicals, but for all the referencing that Chazelle does, the focus on the question of when to throw in the towel and get serious about your life is one-hundred-percent him. Anyway, there’s no way I wasn’t going to love a musical that mashes together two of the greatest endings in the history of the genre. (Revealing them might constitute a spoiler, but prepare to be floored.) Check back tomorrow for our final dispatch, which will include best-of-fest picks.